Meat eaters might not be so familiar with pork apart from bacon sarnies and sausage and mash. However, despite these being popular student fare, you might want to experiment with some other cuts and make the most of this versatile meat. Pork really can be eaten for any meal of the day. From a fry-up in the morning to pork chops for dinner, it's an underrated meat that is pretty easy to cook and not too expensive, depending on the cuts you choose. The type of bacon you choose really comes down to personal taste. Some people prefer streaky as it can be fried nice and crisply, while others like the richer flavour of smoked bacon. Bacon is a great standby to have in the fridge: as well as the obvious ingredient for a Saturday morning cooked breakfast, it can also be chopped and used to add flavour to pasta sauces or stews. It can also be wrapped around chicken breasts and cooked to keep the meat moist and add extra flavour. Grilling is a healthier way to cook bacon and you should make sure the grill is preheated to hot before cooking. 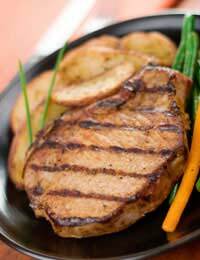 For a quick lunch or dinner, a couple of pork chops will satisfy the biggest appetite. Again, these can be grilled for a healthier option. Serve with some steamed veggies or mashed potatoes, or a side salad if you are cooking them for a lighter meal. You probably think of chicken or lamb first of all if you're planning a roast dinner. However, pork makes a lovely alternative and is no more difficult to prepare than other types of meat. A nice loin of pork served with roast vegetables makes a wonderful Sunday lunch. If you score the skin before putting the loin in the oven, you should get some delicious crackling once it's cooked, which, let's face it, is one of the best bits about having roast pork! As with bacon, your choice of pork sausages really depends on what flavours you like. These days, sausages come with all manner of wonderful ingredients added to them. The best sausages are often those handmade by a good butcher. Farm shops and markets are also a good place to shop for sausages. Its well worth spending a little bit more for a better quality product. You can grill, fry or oven bake sausages and there's really nothing quite like a plate of bangers and mash. Make a simple onion gravy to accompany the meal. You can cook pork mince in pretty much the same way as other types of mince. You could also try making your own pork burgers, adding some spices for a bit of heat. Alternatively, cook the mince with some Indian spices and serve with naan bread for an unusual curry night. You don't really need any specific cooking skills to prepare a delicious pork dinner. From sausages and mash, to pork burgers or roast pork loin, it's a versatile meat that won't break the bank either.